Did Angels Marry Women before the Flood? If you have his mark, you must suffer the seven last PLAGUES! Is he a mysterious superman world dictator yet to appear?... Is he the Antichrist?... or a government?... or a church? THE MOST important question of the hour is: What, or who, is the BEAST, the IMAGE of the beast, and the MARK of the beast spoken of in the book of Revelation? Ignorance will not excuse! "My people are destroyed for lack of knowledge," says the Eternal, in Hosea 4:6. And the illustration of Ezekiel's watchman shows that those who are unaware, because they are not warned, will suffer just the same. (Ezekiel 33:6; and 3:18.) God expects the spiritual leader of His PEOPLE to be His "watchman" (Ezekiel 33:7) and to warn the people. The time is at hand! The plagues of God's WRATH will soon be poured out, unmixed and undiluted — FULL STRENGTH — upon a heedless, God-defying world, and a careless, lukewarm, indifferent Christianity! Every sign tells us these things will happen, plunging the world into the most frantic, frenzied state of anguish ever known, almost certainly WITHIN A MATTER OF A FEW YEARS! It is futile to try to imagine, as so many are doing, what the mark of the beast may be. Too many are trying to speculate in their imaginations. But God says, "My thoughts are not your thoughts." We can't work this out in our minds. We are face to face with a stern reality, not an imaginary fairy tale! There is ONLY ONE WAY to learn the Truth. That is, to study carefully, cautiously, prayerfully, with an open mind yielded to and guided by the Holy Spirit, ALL the testimony of ALL the scriptures that bear on this question. The Bible DESCRIPTION of the "BEAST"
Notice carefully this BIBLE description: "And I stood upon the sand of the sea, and saw a beast rise up out of the sea, having SEVEN HEADS and TEN HORNS, and upon his horns ten crowns, and upon his heads the name of blasphemy." Now these, of course, are all SYMBOLS. The very word beast is a symbol. And our problem is to INTERPRET the symbols, for they stand for real, literal things. And when we know what the heads and the horns are, what the feet of the bear, the mouth of the lion, and likeness to a leopard all MEAN, then we can know what, or who, the BEAST really is! And the BIBLE ITSELF tells us what they represent! In the 7th chapter of Daniel, we find exactly these same symbols described. Here again are the beasts, the seven heads, the ten horns, and here also is the lion, the bear, and the leopard. And here the Bible tells us what these symbols represent. God had given Daniel understanding in dreams and visions (Dan. 1:17): And Daniel had a dream and a vision (Dan. 7:1) in which he saw four great BEASTS (verse 3). And notice, as in Revelation, the beasts came up out of the sea. The first was like a "LION" (verse 4), the second was like a "BEAR" (v. 5), the third like a "LEOPARD" (V. 6), and the fourth was so dreadful and terrible it could not be compared to any wild beast known to inhabit the earth! Now there was only one head described on the lion, one for the bear, one for the fourth beast — but the third beast, the leopard, had FOUR HEADS — thus making SEVEN HEADS in all! And out of this great and dreadful fourth beast grew TEN HORNS! Now notice verse 16, latter part. Here comes the INTERPRETATION OF THE THINGS! The question is, will we accept this BIBLE interpretation of the seven heads, the ten horns, the lion, the bear, and the leopard? And the word "KING" is synonymous with KINGDOM, and used only in the sense that the king represents the kingdom over which he rules, for in verse 23 we read: "the fourth beast shall be the fourth KINGDOM upon the earth." Notice also the word "kingdom" is used to explain the beasts in verses 18, 22, 24, and 27. Now what do the "HORNS" represent? Notice verse 24: "And the ten horns out of this KINGDOM are ten kings that shall arise." Notice the ten horns, or ten succeeding kingdoms or governments, come OUT OF A KINGDOM, not out of a man, or a superman. This alone makes plain that the BEAST IS not some mysterious personal superman yet to come. Also that the beast is not the Roman Catholic Church, for no ten kingdoms ever did, or will, come OUT OF that church. And since "king" in these prophecies only stands for the KINGDOM he represents, and since the words are used interchangeably, it follows that these ten horns are ten succeeding KINGDOMS growing OUT OF the FOURTH kingdom, which was to rule the earth! "This," Daniel says, beginning verse 36, "is the dream; and we will tell the INTERPRETATION thereof to the king." And so we see that here are four universal world-ruling Gentile kingdoms. They begin with the Chaldean Empire, which took the Jews captive to Babylon. They continue through four great universal kingdoms and out of the fourth grows ten succeeding governments. These carry to the time of the Second Coming of Christ, and the setting up of the KINGDOM OF GOD to fill the whole earth and last forever. Plainly, here are described the SAME FOUR universal world-ruling Gentile powers that are described by Daniel's four beasts. And this dream-image identifies WHO they are. The first was Nebuchadnezzar's kingdom, the Chaldean Empire, called "Babylon" after the name of its capital city, 625-539 B.C. The second kingdom, which followed, then, we know from history was the Persian Empire, 558-330 B.C., often called Medo-Persia, composed of Medes and Persians. All ancient history students know the third world kingdom was Greece, or Macedonia under Alexander the Great, who conquered the great Persian Empire 333-330 B.C. But Alexander lived only a short year after his swift conquest, and his four generals divided his vast empire into four regions: Macedonia and Greece, Thrace and Western Asia, Syria and territory east to the Indus river, and Egypt. So these were the four heads of the third beast of Daniel 7. And the FOURTH KINGDOM, which, developing from Rome, spread out and gradually absorbed one after another of these four divisions — "Dreadful and terrible, and strong exceedingly, was the ROMAN EMPIRE (31 B.C. to A.D. 476). And so John, in Rev. 13, sees, not four beasts, but ONE beast. Not a leopard, but LIKE a leopard — possessing all its cunning, cruelty, and speed. But it also possessed the dominant characteristics of the two other most powerful beasts — the FEET of a bear, and the MOUTH of a lion. Daniel's fourth beast, the Roman Empire, had absorbed and therefore it included the three beasts before it. Thus it included all seven HEADS. And John's beast also has SEVEN HEADS. It was Daniel's fourth beast, ONLY, which had TEN HORNS and John's beast has TEN HORNS. And so, if we are willing to be guided solely by the BIBLE description of this "beast" and to let the BIBLE interpret the symbols used to describe it, we come to the inevitable conclusion that the beast of Rev. 13 is the ROMAN EMPIRE, of 31 B.C. to A.D. 476! Of course, many man-imagined THEORIES, widely taught and published, interpret this BEAST otherwise — some as the Roman Catholic Church, some as a mysterious, individual, superman yet to come. But these theories will not stand the test of applying the BIBLE interpretation to all the symbols that describe this beast. Nebuchadnezzar's image, by the TWO legs, describes the TWO DIVISIONS of the Roman Empire, after A.D. 330; West, with capital at Rome, and East, with capital at Constantinople. John also pictures this BEAST, not as a church, or as an individual man, but as a powerful GOVERNMENT having a great ARMY. For they worshiped the beast by saying: "WHO IS ABLE TO MAKE WAR WITH HIM?" (Rev. 13:4). "And I saw one of his heads as it were WOUNDED TO DEATH; and his deadly wound was HEALED; and all the world wondered after the beast. The beast here symbolized is the one which included the royal splendor and kingly power symbolized by the MOUTH of the lion (Babylon); the ponderous strength symbolized by the FEET of the bear (Medo-Persia), and the speed, cunning, and cruelty of the leopard (Greece). Since the INTERPRETATION of these symbols is found in Daniel 7, and since the fourth beast had ten HORNS, the Bible interpretation of the BEAST of Revelation 13 is the FOURTH BEAST of Daniel 7 — the Roman Empire, of 31 B.C. to A.D. 476. The beast described by John in Revelation 13 included 7 heads, but the only head existing at the time John saw this nondescript beast (which included the most powerful characteristics of all the beasts symbolizing its predecessors) was that of the fourth beast of Daniel, containing the SEVENTH HEAD, and also the TEN HORNS. So the specific "one of its heads" that was wounded to death was the seventh head of the Roman Empire — the head out of which TEN HORNS grew. The ten horns, as Daniel interprets, represent ten successive governments OUT OF the Roman Empire, which were to continue until the setting up of the KINGDOM OF GOD at the Second Coming of Christ. Some have said "pagan Rome." But will we be guided solely by the BIBLE INTERPRETATION of its own symbols? Then, if we will, the dragon is a symbol which means Satan, THE DEVIL. Notice Revelation 12. "The great DRAGON... that old serpent, called the DEVIL and SATAN" (verse 9). "He was cast out into the earth... the DEVIL IS come down unto you, having great wrath... and when the DRAGON saw that he was cast unto the earth" (vs. 9,12-13). "And he laid hold on the DRAGON, that old serpent, WHICH IS THE DEVIL and Satan..." (Rev. 20:2). They worshiped the beast (Rev. 13:4). Therefore some conclude, from this one statement alone, that the beast must be the papacy, not knowing that the people worshiped the Roman Empire and its emperors! Notice how they worshiped the beast — saying WHO IS ABLE TO MAKE WAR WITH HIM? The Roman Empire was the greatest WAR MAKING POWER the world had ever known, but the Catholic Church never had an army. This beast killed by the SWORD (v. 10) but the Catholic Church never did. History is full of accounts of the worship of the Roman emperors, for paganism was a STATE RELIGION. The following is from Robinson's Medieval and Modern Times, an older college textbook, page 7. "The worship of the emperor: In a word, the Roman government was not only wonderfully organized... everyone was required to join in the worship of the emperor because he stood for the majesty and glory of the dominion... all were obliged, as good citizens, to join in the official sacrifices to the head of the state, as a god." But when the seventh HEAD of this great beast received its DEADLY WOUND in A.D. 476, was that the end? No, the prophecy says "HIS DEADLY WOUND WAS HEALED... AND POWER WAS GIVEN UNTO HIM TO CONTINUE FORTY AND TWO MONTHS." The TEN HORNS represent ten successive kingdoms to follow OUT OF this kingdom. So, through the ten horns growing OUT OF this head (the Roman Empire of 31 B.C.-A.D. 476), the BEAST (for the ten horns are PART OF the beast) continues until the Second Coming of Christ. The text says one of his HEADS was wounded to death. The BEAST INCLUDED THE SEVEN HEADS and the TEN HORNS. John sees the beast living in the days of its seventh head, the Roman Empire. And when that HEAD of the beast had its deadly wound, HIS — the beast's — deadly wound was healed. The horns now reign, one by one. These three kingdoms, sweeping into the Roman territory, filled the period known in history as the "transition age." (See Myers' Ancient History, page 571.) That is, a TRANSITION between the wound and the healing. Now Daniel saw a "little horn" coming up AMONG these ten, before whom these first three were "plucked up by the roots." That leaves 7 horns to come. And of the little horn, Daniel 7 says "his look was more stout than his fellows." The papacy dominated completely all the horns to follow. Now, notice verse 5, of Revelation 13. Power was given to this beast, once healed, to "CONTINUE FORTY AND TWO MONTHS." In the prophecies pertaining to the times of Israel's punishment, each day represents a year in the actual fulfillment (Ezek. 4:4-6, Num. 14:34). Thus, the healed beast is to continue 1260 YEARS. Following the healing, in 554, came the Frankish kingdom (French), the Holy Roman Empire (German), the Hapsburg dynasty (Austrian), and Napoleon's kingdom (French). But, when Napoleon was crushed in 1814, the healed beast continued no longer. "So CLOSED," says West's Modern History, page 377, A GOVERNMENT THAT DATED FROM AUGUSTUS CAESAR." (From 31 B.C.) It went into Abyss! At that time, eight of the horns having appeared and gone, the beast itself went into the non-existent condition symbolized in Rev. 17:8 as the "bottomless pit." But by the year 1870, Garibaldi had united the many little divisions in the peninsula of Italy into one nation, and the kingdom thus established began the ninth horn, which culminated in the Fascist rule of Mussolini. We shall deal later more specifically with the 17th chapter of Revelation in this connection. Then we shall prove beyond doubt that the "harlot woman," BABYLON THE GREAT, is the Roman Catholic Church. But let us note in passing that the woman, the Catholic Church, with the papacy, never rode on any part of this beast of Rev. 13 except its last seven horns! She is the "little horn" of Daniel 7, whose "look was more stout than his fellows," and who caused the first three to be plucked up by the roots. Justinian was the first ruler who ever acknowledged the supremacy of the pope in the West. And since, in the 17th chapter, the woman rode on all seven of the heads of the beast there pictured, and since she rode none of the heads but only the last seven of the horns of the 13th chapter beast, it follows that the seven horns of the "healed beast of the 13th chapter FORM the seven HEADS of the beast of the 17th chapter! Notice, at the time John saw the beast, five are fallen, one is, and one is yet to come (Rev. 17:10). The five that are fallen are the five during the 1260 years in which power WAS GIVEN, by the papacy, for the healed beast to CONTINUE. The one that "is," is the kingdom that extended from Garibaldi to the downfall of Mussolini. It was not in any sense the power-wielding old Roman Empire, so during the stage of this 9th horn (Rev. 13) or 6th head (Rev. 17) John speaks of it as the Beast that was, and is not, and shall arise once more OUT OF THE BOTTOMLESS PIT. The 10 "horns" symbolized by the 7 heads with its 10 horns in the 17th chapter, yet to come, will be, as the 17th chapter explains, the revival of the BEAST, the Roman Empire, "out of the bottomless pit" by a "United States of Europe," or federation of 10 European nations within the bounds of the old Roman Empire. (Rev. 17:12-18.) This is actually beginning today! When Jesus comes, the Roman armies will be ready for ARMAGEDDON. The entire beast of Rev. 17 — the revivals of the Roman Empire — is a part "of the seven" heads of Rev. 13 and Dan. 7 because it comprises the last seven horns. Yet this revived Roman Empire is "the eighth" system differing from the seven before it (Rev. 17:11). The NUMBER of the "BEAST" ...666 — Whose Number Is It? "And that no man might buy or sell, save he that had the mark, or the name of the beast, or the number of his name. Here is wisdom. Let him that hath understanding count the number of the beast; for it is the number of a man; and his number is Six hundred three score and six" (Rev. 13:17-18). 1. The beast has a NUMBER, and may be identified, if we have wisdom, by this number. 3. We are told to COUNT this number — that is, add it up. The same Greek word is used elsewhere only in Luke 14:28: COUNT the cost. 4. This number, 666, is the number of the BEAST. The only BIBLE interpretation of this symbol, "beast," is a kingdom or the king who rules it, and therefore, really IS the kingdom (Dan. 7:17, 18, 22, 23, 24, 27). Therefore 666 must be the number of the KINGDOM, or GOVERNMENT, or EMPIRE, as well as that of the king who founds or rules it. In the 17th chapter of Revelation we find a beast, and a woman — a great, wealthy woman called "a whore" — who was riding the beast. The Bible describes the symbol "woman" to mean a CHURCH. See II Cor. 11:2; Rev. 19:7; Eph. 5:23-27. On the other hand, "beast" is a symbol of a KINGDOM, or EMPIRE. The woman of the 17th chapter is described beyond possibility of doubt as the church which did reign over the kingdoms of the Holy Roman Empire. Let us be consistent. The beast of Revelation 13 is not the WOMAN who rode the beast — the beast is the GOVERNMENT, and the woman is the CHURCH. The beast of Revelation 13 is THE ROMAN EMPIRE! This beast had a DEADLY wound (Rev. 13:3). That means the beast ceased altogether to exist or function as it had since 31 B.C. Yet its deadly wound was later healed, after which (verse 5) it continued to exist another 1260 years! Those who believe the Catholic Church is the beast say this deadly wound came in 1798. But the pope was not forced into exile that year. The Catholic Church did not die, nor for one day did it cease to function. The popes did live in VOLUNTARY exile, beginning some sixty years later, as a protest against the Italian government until the agreement with Mussolini. But that could in no sense be called a wound TO DEATH. And those who teach this do not expect the Catholic Church to continue on another 1260 years. The founder and first king of Rome was ROMULUS. The Roman Empire was named after him. His name, the name of a MAN, also is the name of the KINGDOM. And every citizen in the kingdom bears the same name — a ROMAN. When John wrote this Revelation, telling us to COUNT the number of the Beast, he wrote in the GREEK language. Consequently, we should look for this name, and the number 666, in this language recognized in the BIBLE, not in the Latin. In the Greek, the language in which Revelation was written, this name is "LATEINOS." It signifies "Latin man" or "the name of Latium," from which region the Romans derived their origin and their language. This word, too, signifies "ROMAN." In the Greek, L is 30, A is 1, T is 300, E is 5, I is 10, N is 50, O is 70, S is 200. Count these figures. They count to exactly 666. And more remarkable — catch this — no other two words have ever been found in two languages, meaning the same thing, and exactly counting, in the numerical value of those languages, to 666! But the same number — 666 — is branded on the man who headed the puny "6th head" of the symbolic "Beast," and also on the pope. V is 5, V is 5, I is l, L is 50, D is 500, V is 5, C is 100, E has no number. Now count them, and you have exactly 666! But, some will ask, does not this number apply to the POPE? Some teach "the words 'VICARIUS FILII DEI' are on the pope's triple crown." And these Latin words, in the Roman numerals, count to 666! The pope does, on some occasions, wear a triple crown, BUT THESE WORDS ARE NOT ON IT! We should be careful to PROVE all things. The denomination which teaches this sent Prof. C. T. Everson to Rome, where he gained access to, and made diligent search in the Vatican archives, but he could find no crown or record of such a crown containing these words. However, while "VICARIUS FILII DEI" is not among the acknowledged titles of the pope (see Cath. Encycl. ), he does claim to be VICAR OF CHRIST on earth. Also, for 1260 long years the popes did reign and rule over the BEAST. They were, in effect, the religious heads of the empire, ruling over the emperors, as well as over the church. And so is it indeed significant that this title, too, counts 666? And so this number is branded on the ROMAN EMPIRE, on the founder and first king of the Latins, on every ROMAN, and even on MUSSOLINI. Could anything be more conclusive? He also has an ecclesiastical organization — a CHURCH — as his instrumentality in deceiving the world. In 2 Corinthians 11:14, we find Satan is transformed into an "ANGEL OF LIGHT." According to Revelation 12:9 and 20:3, he has DECEIVED the whole world. How? Paul tells us in 2 Corinthians 11:13-15, Satan has HIS ministers who pretend to be the ministers of righteousness, but are actually false apostles, deceitful workers, calling themselves the ministers of Christ! Therefore they claim to be CHRISTIAN ministers. They are the MANY, not the few, because all prophecies say it is the MANY, not the few, who have been DECEIVED. Satan's main labor for six thousand years has been the deceiving of the world. "And I beheld another beast coming up out of the earth; and he had two horns like a LAMB, and he spoke as a DRAGON. Who — what — is this "beast"? Some say it will be the United States aligned with the papacy. Some believe it is a federation of Protestant churches. Others declared it the Pan-American Union. MOST church organizations ignore this very vital subject completely, or say frankly, "WE DO NOT KNOW!" Notice, after John saw one BEAST, which we have proved to be the ROMAN EMPIRE, he now sees ANOTHER — a different — beast rise up. 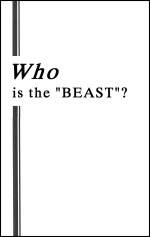 We have learned that "BEAST" is a symbol for a kingdom, or government (Dan. 7:17, 23), and the term represents either the kingdom or its leader, as the case may be (Dan. 7:17, 23). So here is some kingdom or government masquerading as that of CHRIST, or the KINGDOM OF GOD, but actually being a government of SATAN! Christ did not set up a government (kingdom), at His first appearing on earth. After His resurrection the disciples asked Him if He would at that time restore the KINGDOM (Acts 1:6); but He did not. The Church is not the Kingdom. Because some thought it was, Jesus spoke the parable of Luke 19:11-27 to show that He first must ascend to His Father's throne in heaven to receive the royal power to become King of kings, to set up the world-ruling Kingdom of God. But Satan is a deceiver, and he has deceived the world into supposing his (Satan's) CHURCH, and system of churches, is the Kingdom of God. The first beast is the Roman Empire. Here is ANOTHER government, also controlled by Satan, pretending to be CHRIST'S government, the Kingdom of God, taking, exercising, using, employing, ALL the power of the first kingdom, the Roman Empire. Now when? "He exerciseth ALL the power of the first beast before him, and causeth the earth and them which dwell therein to WORSHIP the first beast, whose deadly wound was healed" (verse 12). So, it was AFTER the deadly wound (of A.D. 476) was healed. It was healed when Justinian brought about the restoration of the Empire in the West in A.D. 554. Consequently this RELIGIOUS government took over, exercised, by ruling, all the power of the Roman Empire AFTER A.D. 554 when it was called the Holy Empire and, later, the Holy Roman Empire. Did a Church Government Rule Rome? So here we have pictured a government — a RELIGIOUS government — appearing as CHRIST'S government, masquerading as the KINGDOM OF GOD, actually ruling the civil Roman Empire, AFTER A.D. 554. Was there such a government? Indeed there was! And only ONE! Prior to 554, Justinian had written a letter to the pope, acknowledging his supremacy in the West. And when he restored the empire in the West in 554, the popes dominated the Western Empire from Rome. The Roman Empire, thus restored to continue until 1814 (1260 years), became known later as "The HOLY ROMAN EMPIRE." We read in history that the popes were accepted as the "Vicars of Christ," which means "IN PLACE OF Christ." The teaching was that the Second Coming of Christ had occurred — Christ had returned to earth, as KING of kings and as LORD of lords, in the person of the popes. The millennium had begun. For the entire 1260 years, the emperors accepted the popes as such, ruling the nations with a "rod of iron" as Christ is to do WHEN He really comes. Consequently they acknowledged the supreme religious power of the popes. The Church was organized as a GOVERNMENT — as a dual, two-fold government (symbolized by its TWO horns or kingdoms — for "horns" symbolize kingdoms also — see Dan. 7:24). It embodied CHURCH government, and it also was a STATE, or civil government, always occupying a certain amount of territory over which it, alone, ruled as an independent sovereign state — in addition to actually ruling over the vast civil kingdom called the Holy Roman Empire. Even today, it is a separate, independent, sovereign STATE. Most nations send ambassadors to the Vatican, just as they do to the United States, or to Italy, Britain or the USSR. In most any encyclopedia, under article "MILLENNIUM," you will read the history of this very event — of how the "Holy Roman Empire" was called the "Kingdom of God upon earth." They claimed the MILLENNIUM had arrived! Notice verse 14: "And DECEIVETH them that dwell on the earth by the means of those miracles which he had power to do in the sight of the beast." Verse 13 says "he doeth great wonders." First, note Rev. 17. Here is pictured a woman. In II Cor. 11:2, Eph. 5:22-27, and elsewhere, we learn that "woman" is a symbol for CHURCH. This woman is a fallen woman — an apostate church — and a great one, called "the great whore," pictured as ruling over many nations, verses 1, 15. In verse 3, this great false church is pictured sitting on a beast "having seven heads and ten horns." A woman riding a horse guides, controls, the horse. It does her bidding. It is well known by ALL who understand Bible prophecy that this 17th chapter of Revelation pictures the Roman Catholic Church ruling over the so-called Holy Roman Empire. Notice, verse 18, she is "that great city which reigneth over the kings of the earth." Notice, verse 2, the inhabitants of the earth have been DECEIVED by this great false church. Also Rev. 18:3, she has deceived all nations. Next, notice II Thes. 2:3-4. The day of Christ — and the coming of Christ — shall not come, until there be a falling away, and a "MAN OF SIN" be revealed. He exalts himself above all that is called God. As God, he sits in a temple claimed to be the temple of God, showing himself to deceive people into accepting him AS God. God is our HOLY FATHER. This man, then, would claim the same title. This wicked man is to be DESTROYED at, and by, Christ's coming (verse 8). Notice verses 9-10: "even him, whose coming is after the working of Satan with ALL POWER and SIGNS [miracles] and lying WONDERS, and with all DECEIVABLENESS of unrighteousness...."
Here is the head of a vast ecclesiastical empire, performing miracles and lying wonders, with which he DECEIVES people everywhere. This deceiving religious ruler will still be active clear down to ARMAGEDDON and the Second Coming of Christ! In Rev. 16:13-16 are described three foul spirits. They come from the dragon which is the devil; from the beast, which is the civil Roman ruler; and from the mouth of the false prophet associated WITH the Roman ruler. "For," continues verse 14, "they are the spirits of [demons], WORKING MIRACLES, which go forth unto the kings of the earth and of the whole world, to gather them to the battle of that great day of God Almighty." And they are gathered, finally, at ARMAGEDDON! Note it! Yet future, the Roman ruler, as the Roman Empire is again restored, along with a great religious leader — and all in the power and influence of the Devil! Working MIRACLES! All prophecies concerning them show these powers doing the same things! Now notice the last battle of "the great day of God Almighty." It is in Rev. 19:19-20. Here is pictured the beast — "and WITH him the false prophet that wrought miracles before him, WITH WHICH HE DECEIVED them that had received the MARK of the beast, and them that had worshipped HIS IMAGE." Note it! Compare with the two-horned beast of Rev. 13:11-17. Certainly, then, this two-horned beast, the false prophet, the man of sin and the woman that rode the beast are all one and the same thing — the ROMAN CATHOLIC CHURCH with its pope, its other bishops, its priests and deacons, comprising the hierarchy of order! "And deceiveth them that dwell on the earth" — HOW? "... saying to them that dwell on the earth, that they should make an IMAGE to the beast, which had the wound by the sword and did live. And he had power to give life unto the image of the beast, that the image of the beast should both speak, and CAUSE as many as would not worship the image of the beast should be killed. AND HE CAUSETH ALL, BOTH SMALL AND GREAT, RICH AND POOR, FREE AND BOND, to receive a MARK in their right hand, or in their foreheads: and that no man might buy or sell [trade, earn a living, hold a job], save he that had the mark, or the name of the beast, or the number of his name" (verses 14-17). So, notice: This two-horned beast not only CAUSED people to receive the MARK of the beast (compare Rev. 19:20), but also perpetrated the forming of an image that caused the martyrdom of saints. As many as would not worship this image were caused to he killed. This false church did not kill them — she CAUSED them to he killed. History shows that the civil government of the Roman Empire martyred millions who were declared "anathema from Christ," or "heretics" by the church. Compare with the WOMAN who rode the Beast in Rev. 17: "And I saw the woman DRUNKEN WITH THE BLOOD OF THE SAINTS, AND WITH THE MARTYRS OF JESUS' (verse 6). Certainly these are one and the same! Now this great church, which is a twofold government, deceived the people by SAYING THEY SHOULD MAKE AN IMAGE OF THE BEAST. Note it (Rev. 13:14) — that is HOW this church deceived people. What is an IMAGE? The dictionary says a "likeness," a "copy, representation, model, semblance, counterpart." So here is a great CHURCH saying, "Let us make a MODEL, or counterpart, of the civil Roman GOVERNMENT" — for that is what the BEAST is — a PAGAN GOVERNMENT. WHERE, then did human CHURCH GOVERNMENT derive its present form? "The first pope, in the real sense of the word, was Leo I (440-461 A.D.)," says the Cyclopedia of Biblical, Theological, and Ecclesiastical Literature, Vol. 7, page 629. To him the form of GOVERNMENT of the Roman Empire was the most marvelous thing on earth. It became an obsession. He applied its principles to the CHURCH, organized the church into a GOVERNMENT, forming the PAPACY. This CHURCH GOVERNMENT or ORGANIZATION is the IMAGE OF THE BEAST! This CHURCH GOVERNMENT, then, according to this historical authority, is in fact a MODEL, a COUNTERPART, AN IMAGE of the BEAST which is the Roman Empire GOVERNMENT. The Britannica calls it an ECCLESIASTICAL WORLD EMPIRE! This IMAGE — man-designed and man-ruled church government — compelled people to WORSHIP THE CHURCH! And since the church was organized into a worldly government, this was worship of the IMAGE — FALSE worship — IDOLATRY!! But this church became a MOTHER, and DAUGHTER CHURCHES came out of her, in "protest," calling themselves "PROTESTANT." And ALL have worldly, political CHURCH GOVERNMENT. "Upon her forehead was a name written, MYSTERY, BABYLON THE GREAT, THE MOTHER OF HARLOTS" (Rev. 17:5). Her daughters are called "harlots." Together, they are called "BABYLON." They are pagan, teaching pagan doctrines and customs, cloaked in the NAME of Christianity! And ALL NATIONS are deceived! Yes, human-organized CHRISTIANITY, not Bible designed spiritual-organism government, is the IMAGE of the BEAST. It is the pagan political COUNTERFEIT of God's government.